Pandan Steamed Bun or Pandan Mantou. 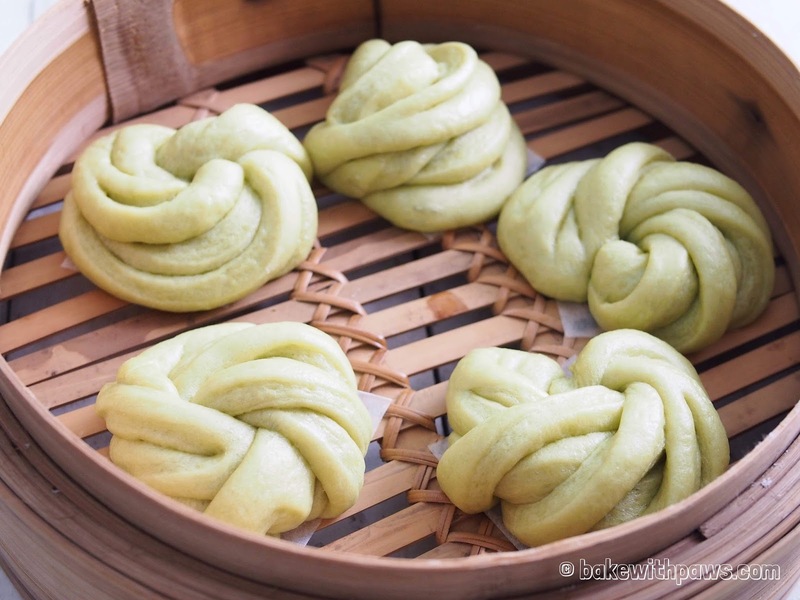 This Pandan Mantou is made with the fresh pandan leaves from our garden. My kitchen was filled with the pandan aroma when I steamed these buns. 2. Cover the bowl with kitchen towel or cling wrap and let the dough rest for 30 – 45 minutes. - Lightly dust the working surface with flour. Gently punch down the dough to deflate. Roll the dough to form a log. Cut and divide into 10 equal portion. - Shape the dough into a ball. - Then roll into a rectangular shape with the rolling pin. - Brush thin layer of oil on the dough. - Cut slits onto the dough with pizza cutter or sharp knife. Make sure not cutting through the both ends. 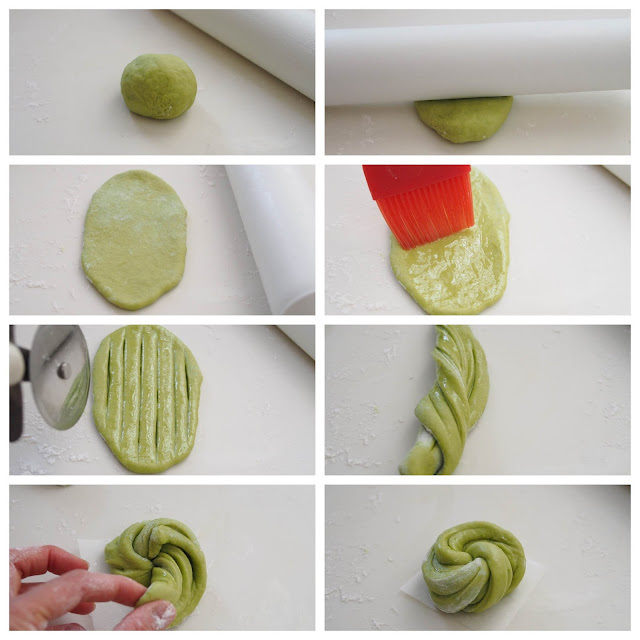 - Twist the twisted dough into a knot. Hide the both ends underneath the mantou. - Place each flower mantou on a piece of baking parchment paper. 5. Spread the mantous on the bamboo steamer about 1 inch apart as the dough will rise. Let the mantou rise for another 15 to 20 minutes in semi warm area. 6. Prepare the steamer and steam for 10 to 12 minutes over the medium heat. 7. Once it’s done, open the cover slightly to release the heat for few minutes. Transfer the bamboo steamer away from the water and let it stand for another few minutes before removing the cover. With this, the mantou will not shrink after cooling down. 1. Chop pandan leaves into chunks. In a food processor, add pandan leave and water. Blend until fine. 2. Place pandan paste in a muslin bag and squeeze out the juice. If you don’t have a muslin bag, use your hand to squeeze out the juice through a sieve. 1. I normally leave the dough in the same bowl of electric stand mixer after kneading and cover the bowl with kitchen towel for proofing. 2. The oven is an ideal place for rising the dough. TURN On the oven at the lowest setting for 1 minutes, then TURN IT OFF.